Every website needs exposure in search engine rankings to succeed. Use this article to learn 4 essential steps that boost SEO, allowing websites to gain more search engine traction and more organic traffic. Search engine optimization (SEO) requires an incredibly specialized skillset that many webmasters completely lack. SEO is the practice of optimizing your website in a strategic and ethical manner so that you can rank higher within the major search engines like Google, Bing and Yahoo. SEO is a marketing technique, and if you approach it methodically, you boost awareness of your brand and improve exposure in search engine results. Without the help of professional SEO specialist or SEO firm, it’s hard to know whether your strategy is sound and if your efforts are paying off. The good news is that you can easily sharpen your SEO skills. The first step in any SEO campaign is optimizing your current meta tags. This will really lay the foundation and act as the “skeleton” for your website in regards to SEO. Meta tags are the first website element that Google looks at to see what your site covers and what keywords you’re trying to target. Google’s crawl bot uses meta tags to rank your website within search results for the keyword phrases included in these tags. Your title tags hold the most weight in the eyes of Google and other major search engines. When a user searches for a term, the title tags appear as the blue links that title each search result. Your title tags should contain your most important target keyword phrases and explain to the search engines what the page is about. Optimize your title tags by making sure they are as close to 70 characters as possible without going over. Meta descriptions are the snippet of text that is found underneath the title tag in search engine results. Carefully crafted meta descriptions can boost the rate of users who click through to your website when they find it in the search results. Your meta descriptions should be compelling and unique for each page. You should briefly describe what the page is about to encourage users to click through. Meta tags should be 150 to 160 characters to display correctly in search results. Header tags are the main heading above the text on a given web page. Header tags are visible to your website’s users, so it’s important to write them with your visitors in mind. Header tags should be descriptive and clear, since what your page is about to anyone who visits your website. Be sure to use the hierarchy of these tags to your advantage – in general, you should strive to have more than one header tag on your pages, ordered hierarchically from most to least important. You should use an H1 tag at at the top of the page to announce what content the page will cover. You can organize subsequent information with H2, H3, or H4 tags, depending on the level of importance you want to assign the information. When it’s appropriate and natural, you can weave your target terms into your header tags. Every image on your website should contain a keyword-rich image ALT tag. Image ALT tags are often overlooked but they explain to the search engines what a particular image is about and also offers additional optimization for your website. Image ALT tags are simple, brief tags that allow you to add hidden text descriptions to every picture on your website. They should include target keywords to help Google’s crawlers pick up on what the image displays. If the content on your website is poorly optimized, Google will not know how it answers users’ search queries. Every piece of content on your website should show search engines what user queries you’re trying to rank for, without sacrificing quality or flow of the copy. Ensure relevant keywords are in place. Include internal links that allow users to click through to related content on your website. For example, if you’re writing a blog post on “How to Start a Website,” you should include variations of relevant keyword phrases geared toward users who are seeking instructions on building a website. In addition to using your primary keywords, you can also use long-tail type keywords. Long-tail terms are generally more descriptive and contain 2-6 words strung together in a phrase. Long-tail keywords are easier to rank for because they are less competitive than broader terms, and ranking for them can strengthen your website’s overall SEO. Finally, add internal links within your website content. Internal links direct users to other relevant posts or articles on your website. Internal links pass link equity from page to page while also helping visitors navigate your site more effectively. Link equity (also known as “link juice”) is based off of the page’s overall authority, which can be spread throughout your website through internal linking. When users can easily navigate your content using keywords and internal links, you reduce bounce rates on your website. Every website should use its blog to continuously publish valuable, fresh content for its readers. Content marketing is a proven SEO strategy. Google favors websites that are regularly updated with unique content – as long as it’s quality. Publishing consistently also gives you the ability to target various keyword phrases. Each article you write is an opportunity to target a new search phrase, and over time this can add up to a significant increase in organic traffic. Consistently publishing new content also keeps your readers engaged and wanting more. If they have to wait too long to read new content, they will quickly lose interest. You should producing new content on a weekly basis to increase your chances of ranking highly in search results while strengthening your relationship with your readers. Building high quality, natural backlinks to your website will help increase its domain authority (DA), search engine rankings, and organic traffic overtime. Backlinks are any instances of external websites linking back to your website. DA refers to the overall strength of your backlink portfolio and is scored on a scale of 1-100 (100 being the strongest). You can use guest posting to acquire quality backlinks. Guest posting involves reaching out to relevant sites in your general niche to see if they are interested in accepting a blog post you’ve written. If your article is accepted, you can include a link back to your website. You should target websites that have a higher domain authority than your own website to get the best results – but if you’re just starting out, strive for any website with a DA of 20 or higher. Next, gather all the opportunities you find into a spreadsheet with columns for the website’s URL, DA, contact email, and any other details you’ll need. Once you have enough websites to target, you can simply craft an outreach email to begin contacting them. When improving your website’s SEO, it’s important to be patient. SEO is not an overnight marketing technique. Google always favors websites that have fresh, frequently updated content. Be addicted to generating consistent and quality content. As you build out new website content, make sure all of your meta tags – including title tags, meta descriptions, header tags, and image ALT tags – are optimized. Your website copy and tags should all contain relevant keywords that alert search engines to what your content is all about. Finally, focus on building strong internal linking and backlinks to your website. This will help users navigate your content or find your site in the first place. If you have realistic expectations from the start and put in the consistent effort, you should see organic growth for your website and business over time. 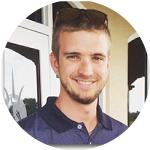 Evan Hoeflich has been involved with Internet Marketing since 2007 and specializes in blogging & SEO. He runs his blog evanhoeflichmarketing.com as a personal case study to help demonstrate specific strategies that have worked for him and his business. Looking for an SEO services company? Read verified client reviews of SEO services and compare companies to find the best provider for your businesses. Find the best-fit SEO service by evaluating cost and services offered.